Who gunned down two black couples on the Moore’s Ford Bridge in Georgia early in the evening on July 25, 1946? The question gnawed at Civil Rights crusader Thurgood Marshall, President Harry Truman and FBI Director J. Edgar Hoover. For decades, it’s haunted the victims’ families, historians and filmmakers. Now, thanks to five years of pro bono work by a Morris County lawyer, answers to America’s last mass lynching finally may be near. On Monday, a federal appellate panel upheld a lower court’s decision to unseal the original grand jury transcripts from the case. According to one account, 2,790 people around Walton County were interviewed by the FBI and 106 witnesses testified over 16 days about the white mob–variously estimated at 30 to 100 people–that dragged World War II veteran George W. Dorsey and Roger Malcolm from a car, seized their wives, Mae Murray and Dorothy, and blasted them multiple times at close range with pistols and shotguns. “It shocks the conscience that no one was ever charged with the act. You can’t tell me no one in that small county was ever brought to justice. It’s an impossibility,” said Rockaway Township attorney Joe Bell. Bell represented his friend, author Anthony Pitch (The Last Lynching: How a Gruesome Mass Murder Rocked a Small Georgia Town) in his quest to obtain the records. The Justice Department appealed Bell’s 2017 legal victory, arguing that grand jury proceedings should remain secret. Appearing before a panel of the 11th U.S. Circuit Court of Appeals in Atlanta last October, Bell noted that exceptions have been made in cases of historical significance, including grand jury matters involving Richard Nixon, the Rosenbergs and Jimmy Hoffa. By a 2-1 vote, the appellate panel upheld the district court’s findings. “There is no indication that any witnesses, suspects, or their immediate family members are alive to be intimidated, persecuted, or arrested,” Circuit Judge Charles R. Wilson wrote in the majority opinion. District Judge James Graham, dissenting, expressed concerns about repercussions for descendants of suspects, witnesses and jurors whose identities may be revealed by the transcript. Without a guarantee of secrecy, future grand jury witnesses might lie to spare children or grandchildren from scorn or ridicule, Graham speculated. The Justice Department declined to comment Tuesday on whether it will appeal to the U.S. Supreme Court. Officials have 45 days to decide. The historian and author, who turns 80 next month, is at work on a new book, Our Crime was Being Black, based on oral histories. Pitch estimates he combed through 10,000 unclassified documents before publishing The Last Lynching in 2016. He is eager to dig into the transcript. “With 16 days of grand jury testimony, there must be something explosive there. That’s what I’m hoping for,” he said. The lynching occurred in a period of heightened racial tension in Georgia, following the state’s first Democratic primary in which African Americans were allowed to vote. ‘ECSTATIC’: Activist Cassandra Greene has spent years pressing for justice in the Moore’s Ford case. Photo via Facebook. Campaigning in Walton County, Gov. Eugene Talmadge had promised whites that he would make sure blacks–he used the N-word–never exercised their franchise, said activist Cassandra Greene. For more than a decade, she has marked each anniversary of the lynching with a re-enactment at Moore’s Ford, to keep pressing for justice. “I see so many parallels between what’s happening how, as far as voter suppression, and legal lynchings of African American men,” said Greene. Her efforts are chronicled in Always In Season, a new documentary honored at the Sundance Film Festival. Roger Malcolm had been arrested for stabbing a white farmer during a fight, shortly before the murders. J. Loy Harrison, who employed the Malcolms and Dorseys as sharecroppers, drove them to jail to post a $600 bond. His car was besieged as they were returning to Harrison’s farm; the Ku Klux Klan’s involvement was widely suspected. Did Harrison tip off the Klan? He told authorities he could not identify the killers, according to the Equal Justice Initiative, which has documented nearly 4,000 lynchings in a dozen Southern states between 1877 and 1950. The nation was shocked. Future Supreme Court Justice Thurgood Marshall, then a special counsel to the NAACP, condemned the atrocity, and President Truman ordered an FBI investigation. A district court judge in Georgia convened a grand jury in late 1946. State and federal authorities continued to pursue leads into this century. Bell, now 70, joined the cause after taking Pitch’s Washington DC tour of Abraham Lincoln’s last day. “He approached me and asked, ‘Do you know anything about grand jury transcripts?’” Bell recounted. When Pitch explained the Moore’s Ford project, the lawyer was all in. “Every once in awhile as an attorney you can do the right thing. I feel I’ve accomplished that with this case,” said Bell, adding that his feet still haven’t touched the ground since his staff at Bell & Shivas P.C. broke the news of his appellate victory. Taking up a battle that is seven decades old, in which virtually all the key players are dead, might seem unconventional. Yet Bell’s career never has followed a traditional path. Morris County lawyer Joe Bell and author Anthony S. Pitch are trying to solve a 1946 lynching that shocked the nation. Photo courtesy of Bell & Shivas. For years he took night classes at Seton Hall University Law School, and later, at New York University, where he studied labor and employment law. 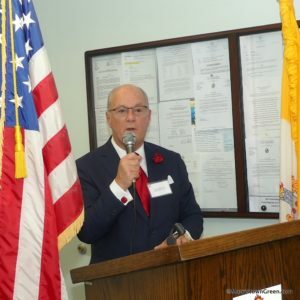 At the same time, he worked for then-Congressman Jim Courter, served as a popular Morris County Clerk, and raised four children with his wife Linda. Although the Moore’s Ford case has been long and hard, “I wouldn’t trade it for anything in the world,” Bell said. He has met many wonderful people, he said, including descendants of the victims–to whom he wishes to bring a sense of closure. Cassandra Greene, the activist from Atlanta, wants that, too. An attitude of let’s-move-on, que será, será, would be one more crime against the victims and their kin. Absolute justice probably is beyond reach, “but we need the truth to be told,” she said. Pitch feels the same way. “We owe it to future generations to get to the bottom of this, warts and all,” said the author, describing himself as “over the moon” about the appellate decision. And if the case lands in the Supreme Court, Pitch knows who he is betting on. This story has been updated with comments from Cassandra Greene. Next articleGreater Morristown weekend preview: Valentines, anyone?